Folks with limited arm movement, either through accidents, old age or disability, can often find it particularly hard to put on clothes. With this in mind, researchers created a robot capable of putting clothing onto a person. 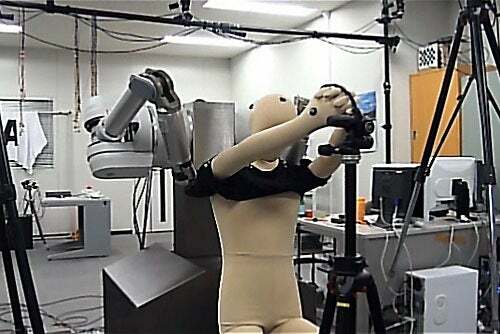 The robot has two arms, and is designed to lift clothing over your head and body. The bot even practices on itself (after being shown by a human) to get the technique just right. The robot is still in its infancy however, so has only been tested on a handful of people, with a limited number of shirt styles. In the future, the robot will hopefully be able to help more individuals, but also identify and put on different items of clothing, and assist with more complex tasks such as pulling up socks and pants.